To help you better understand the fuelling process, we’ve strung together a series of short animations to demonstrate exactly what happens to your body when you exercise without ingesting any carbohydrate (0g per hour), compared with some carbohydrate (30g per hour), significant carbohydrate (60g per hour) and optimal carbohydrate consumption (90g per hour). After working through this section, please take the time to read through the TORQ Fuelling System background on this website where we explain and use animations to demonstrate how the optimal delivery of carbohydrate (90g per hour) is only possible if all of the carbohydrate you consume during exercise consists of 2:1 Glucose-Derivatives:Fructose. That said, the animations below clearly demonstrate that ‘any’ carbohydrate consumed during exercise will benefit performance. The question is, how fast do you want to go, or how long do you want to last? Endogenous (ENDO) refers to carbohydrate that is stored in your liver and muscles – called ‘Glycogen’. Even on a diet rich in carbohydrate, the most you can expect to store is around 500g or 2,000 kCals (and that’s if you’re a well trained athlete – the less conditioned you are, the less you can store). When your stores are full, they’re full, so high carbohydrate consumption in the hours approaching exercise will have no effect on your stores if they’re already saturated. As an example to clarify this point, it would be like leaving the tap running on the bath – once the water level reaches the overflow, the bath will get no fuller however much water you keep pouring in. This is a vital concept to understand and it’s where many people go wrong when it comes to fuelling for optimal performance. One final and very important point to note about endogenous carbohydrate stores is that when they run out, your metabolism will grind to a halt and your pace will drop off dramatically. This is called ‘Bonking’ in cycling or ‘Hitting the wall’ in running. 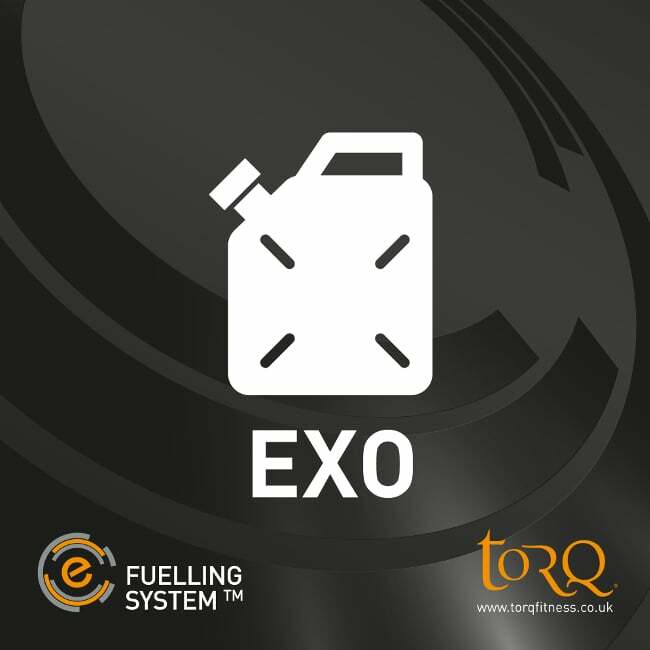 Exogenous (EXO) refers to carbohydrate consumed during exercise and this can be in the form of energy drinks, gels, bars or chews if you consider the Fuelling System items from the TORQ range. Any carbohydrate consumed during exercise, even if it’s a banana or jelly babies, is still considered exogenous carbohydrate however. This carbohydrate enters the blood stream and is burnt preferentially over your endogenous stores. Exogenous carbohydrate isn’t stored, it’s used straight away and the more you can get into your blood, the less of your stored carbohydrate you need to use. It’s important to note that for high intensity endurance activities, it’s impossible to supply sufficient exogenous carbohydrate to halt the depletion of your endogenous stores, all it will do is slow down the regression. The TORQ Fuelling System section of this website explains how all exogenous carbohydrate sources are NOT the same and how 2:1 Glucose-Derivatives:Fructose formulations have been proven beyond doubt to deliver at a faster rate and higher volumes of carbohydrate than any other. Play the short clip above. This demonstrates how a cyclist relying entirely on endogenous stored carbohydrate quickly drains his/her stores and becomes fully glycogen depleted after 1 hour and 20 minutes. Note that the exogenous needle doesn’t move at all, because the cyclist isn’t consuming anything whilst exercising. All of these animated clips assume a very high intensity effort (the effort is exactly the same in each example) and you may have to play each of them a few times to gain a clear understanding of what’s going on. In the clip above, we demonstrate how every time 30g of carbohydrate is consumed, the use of exogenous carbohydrate slows the burn rate of the endogenous stores, the overall benefit being, the maintenance of pace/performance for a longer time period. In this example, the cyclist lasts another 10 minutes as a result of low level fuelling. The clip above demonstrates how consuming 60g of carbohydrate per hour extends time to exhaustion further still through the greater preservation of endogenous stores. And finally, if you play the clip above, notice how much longer the cyclist can sustain his/her performance when consuming 90g of exogenous carbohydrate per hour. As well as explaining why you should fuel, hopefully these examples have made it very clear that the greater the exogenous carbohydrate absorption per hour, the better your performance will be. Not all energy products are the same, because a number of factors can affect carbohydrate absorption/delivery rates. You will only be able to consume 90g carbohydrate per hour if you consume fuel that consists of 2:1 Glucose-Derivatives:Fructose and this is backed extensively by a significant number of peer-reviewed published research studies. Click HERE to learn more (all the independent research is referenced at the bottom of the page). Incidentally, just in case you’re wondering, if we were to run a series of animations showing what happens during lower intensity endurance exercise, the results would be exactly the same in relative terms. In each example, the cyclist would last longer, but the same principles would apply – the greater the exogenous fuel intake, the longer the cyclist would last. In our final clip above, we pull all of these principles together and demonstrate how fuelling ‘affords’ a higher pace over a given time. In order for the athlete consuming 0g of carbohydrate per hour to be able to sustain a consistent pace for a 2 hour effort, his/her pace needs to be moderated downwards to avoid bottoming-out the endogenous stores and bonking – this means riding slower. On the other hand, the athlete on 90g of carbohydrate per hour can afford to push on at a far stronger pace, cover a larger distance and still finish with fuel in the tank. In this example, the well fuelled rider covers 10 more miles over the same time frame and still has 25 to 30% of his/her endogenous stores remaining at the end of the effort. The fact that the endogenous stores are less damaged despite a higher intensity effort is actually fundamental to understanding the principles of the TORQ Recovery System. If you fuel diligently, you will not only have performed better and created a bigger training stimulus, you will also have kick-started the recovery process. More on the TORQ Recovery System if you click HERE. Our guidelines are simple. Take 2-3 TORQ units per hour. 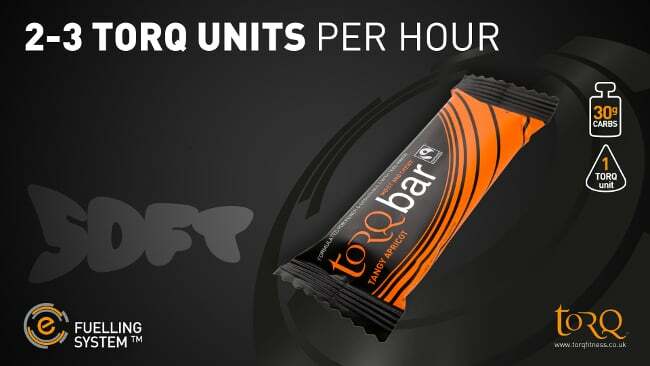 1 TORQ unit equals 30g of multiple-transportable carbohydrate and we have made consuming your TORQ units extremely easy by creating uniformity across our product range. 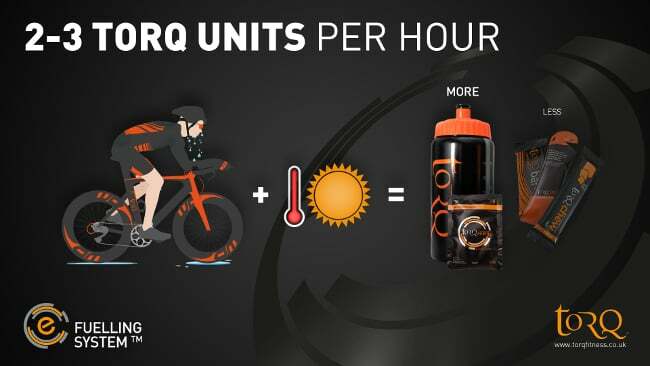 If the weather is hot and/or perspiration rates are high, it makes sense to consume more 500ml TORQ Energy drink units, because you’ll be simultaneously taking on board both fluid and electrolytes with your carbohydrate to facilitate hydration. 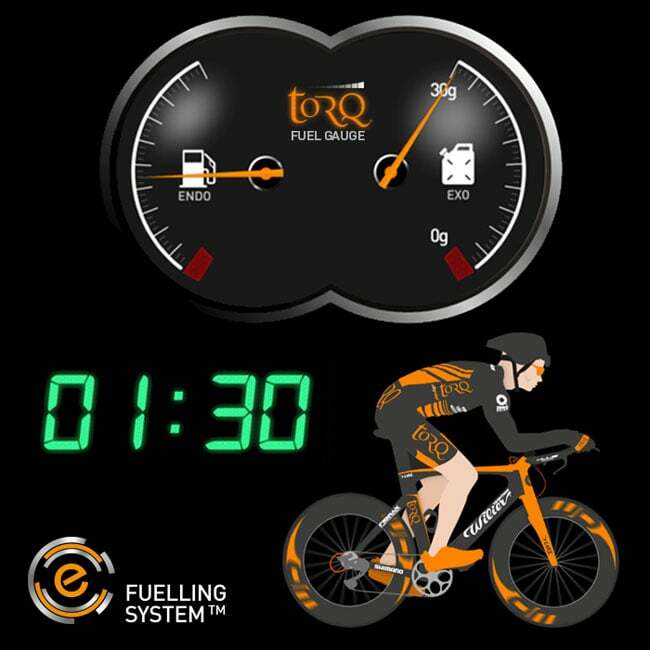 Although we have simplified our message in the animations earlier by indicating that the rider takes his/her carbohydrate in discrete 30g units, obviously in reality, you’re not going to consume 500ml of energy drink (30g of carbohydrate) in 1 swift ingestion – any drink consumed will be ‘smoothed’ over the hour. 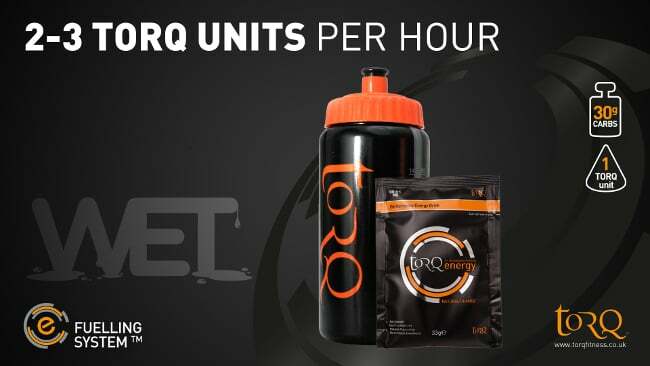 Rest assured – as long as you consume 2-3 TORQ Units per hour in a systematic manner, you will be fuelling properly. In cooler weather, overconsumption of TORQ Energy will fill your bladder and your exercise will be interrupted by toilet stops! 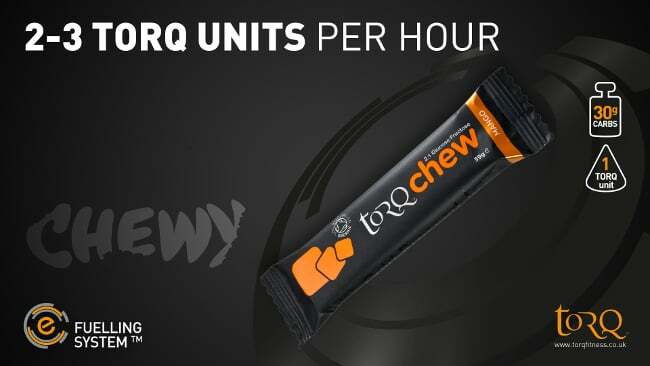 This is where drinking less, but gaining your TORQ units through the more concentrated TORQ fuel sources (Bars, Gels and Chews) makes more sense. Essentially, irrespective of perspiration rates, your fuelling requirements remain constant, but the more you sweat, the greater the need to replace fluid and vital electrolytes. This why the TORQ Fuelling System works so beautifully, adapting to your hydration needs whilst providing the constant supply of fuel essential for optimal endurance performances. In all of the examples displayed on this page, we have used a cyclist for consistency, but whether you’re a runner, open water swimmer or triathlete, the fuelling principles remain the same. So effectively, your carbohydrate intake should always be 60-90 grams per hour (2-3 TORQ units per hour), irrespective of the weather conditions and perspiration rates, but the method you choose to fuel yourself will vary. 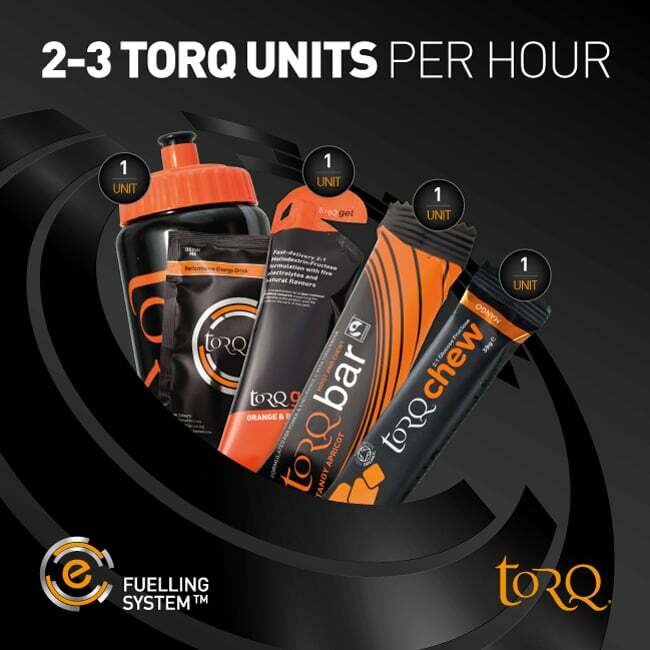 We’re recommending that newcomers and smaller individuals begin with a strategy of 2 TORQ units per hour and experiment with 3 TORQ units per hour as they become more comfortable with a structured fuelling regimen. 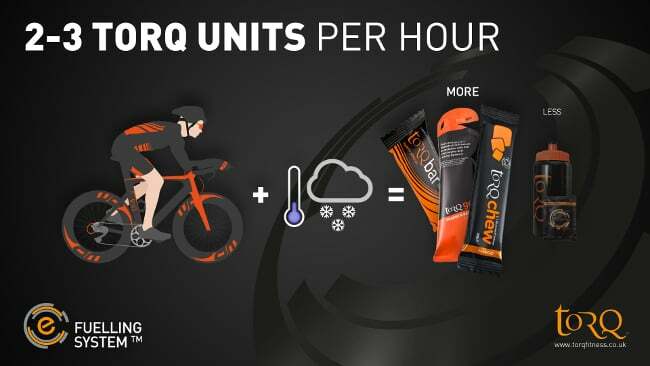 Individuals over 65kg in weight and experienced sports people should be able to move onto 3 TORQ units per hour fairly easily and without any cause for concern, but we would always advise fuelling at 60 grams per hour (2 TORQ units) if in any doubt. What happens if I over consume carbohydrate whilst exercising? 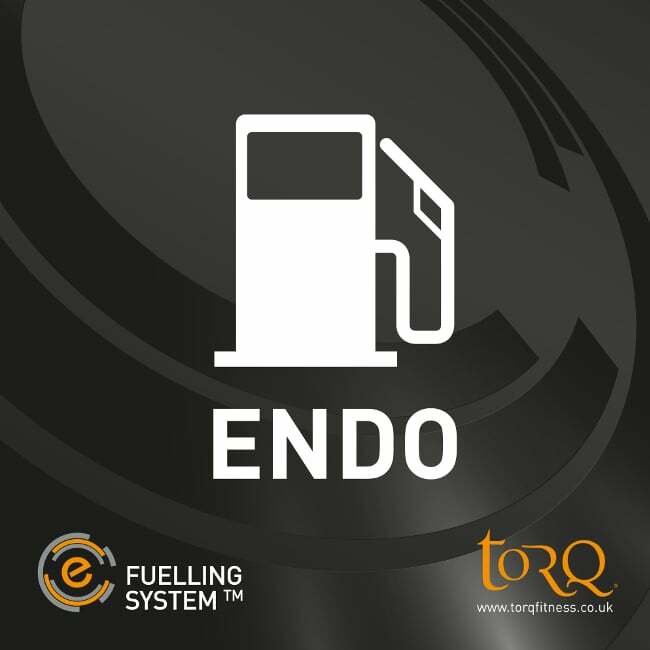 There is little point in exceeding 3 TORQ units per hour from a performance perspective, because you won’t be able to use the extra fuel anyway and over-consumption will cause undesirable gastric discomfort. 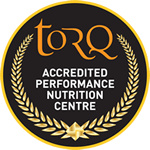 However, the great benefit of TORQ’s multiple-transportable carbohydrate (2:1 Glucose-Derivatives:Fructose) matrix is that it is so rapidly digested and absorbed that the human body can handle larger quantities of carbohydrate than many more traditional formulations. With glucose-only formulations (including maltodextrin-only recipes) having an absorption threshold of only 60 grams per hour, certainly at 2 TORQ units per hour, your body will just soak up the carbohydrate in comparison with very little chance of experiencing gastric issues. Further down this page, we explain why only multiple-transportable carbohydrates (2:1 Glucose-Derivatives:Fructose) can deliver 90g carbohydrate per hour (3 TORQ Units). TORQ Fuelling System essentially provides the tools to experiment with different fuelling textures and as long as you stick to the 2-3 TORQ units per hour rule and listen to your thirst reflex, there really isn’t anything that can go wrong. From a texture perspective, the TORQ Fuelling System also provides the perfect variety with fuelling products ranging from ‘Wet’ to ‘Smooth’ to ‘Soft’ to ‘Chewy’ – TORQ Energy, TORQ Gel, TORQ Bar and TORQ Chew respectively. The choice of texture is all yours. Why are TORQ’s multiple-transportable carbohydrate (2:1 Glucose-Derivatives:Fructose) formulations so much more effective than those produced using a traditional single carbohydrate source? Carbohydrate is the critical fuel source during intense exercise and is essential during bouts of endurance training and competition. The more carbohydrate that is oxidized (burnt) the better your performance, as demonstrated by a mountain of peer reviewed independent research studies. The body has a very limited endogenous supply of carbohydrate, stored in the muscles and liver, and when fully topped up, it equates to around 2000kcal (500grams of carbohydrate). This is a relatively limited pool of carbohydrate and during high intensity exercise it can be completely depleted in as little as an hour. This combined with a limited capacity to absorb carbohydrate into the blood stream in the intestine means that as an endurance athlete competing or training for more than a couple of hours, you are essentially fighting a losing battle. No matter how well you are able to fuel with carbohydrate, you will eventually run out, particularly when performing endurance exercise longer than a couple of hours in duration. As a result, the more carbohydrate that can be absorbed during exercise, the greater the oxidation rate (burning) of exogenous carbohydrate, which reduces the reliance on the body’s endogenous stores. This results in a performance improvement by delaying the dreaded ‘bonk’ and subsequent catastrophic drop in performance! For a number of years the maximum oxidation rate of exogenous carbohydrate was thought to be around 1gram of carbohydrate per minute (60grams of carbohydrate per hour) when using a single form of carbohydrate, such as maltodextrin or glucose. This was limited by the speed at which a single form of carbohydrate could be absorbed by the body. Once the intestinal transporter that absorbs the carbohydrate from the intestine (SGLT1), driving it into the blood becomes saturated, any additional carbohydrate simply ends up sat on the stomach, which is the last thing you want when exercising, since this can result in gastrointestinal upset.  However more recently a growing body of research has suggested greater oxidation rates of carbohydrate are possible if glucose derivatives and fructose are mixed. The animation below shows how transportation of glucose derivatives from intestine to blood (via SGLT1) is limited to 60grams per hour. Play the short video below a couple of times over to fully understand the concept. A study by Wallis et al. in 2005 (as quoted on our gel pack) turned conventional wisdom on its head and sparked a change in the recommendations for fuelling during endurance exercise. Wallis and his research group showed that by combining maltodextrin (glucose) with fructose at a 2:1 ratio, carbohydrate oxidation rates increased by a massive 40% and allowed up to 90grams of carbohydrate to be absorbed into the system! This was due to fructose and maltodextrin using different intestinal transporters (Fructose uses the GLUT5 transporter), which meant that the two carbohydrates could be absorbed independently of each other, allowing a faster absorption and a higher oxidation rate of carbohydrate. The study had massive implications as a 40% increase in exogenous carbohydrate oxidisation would naturally have a big impact on performance by reducing reliance on the body’s limited endogenous stores. Since the study by Wallis et al (2005) there has been a great deal of further research into the use of multiple transportable carbohydrates (i.e. maltodextrin and fructose) and a number of significant benefits to using this formulation have come to light. The animation below demonstrates how the GLUT5 transporter draws fructose through the intestinal wall independently of glucose absorption, resulting in the delivery of a significant 90grams total carbohydrate per hour. Once again, play the video below a couple of times to fully understand the concept. Currell and Jeukendrup (2008) completed one of the first studies which looked directly at the effect of a glucose:fructose, 2:1 beverage on performance. Using a simulated 1hour time trial in the lab after 120 minute of cycling exercise at 55% of their VO2max (maximal oxygen consumption), participants consumed either a placebo (flavoured water), glucose or a glucose:fructose drink. The results of the study were simply astounding. Performance improved by 8% as a result of using two forms of carbohydrate, which was on top of a 10% improvement in performance from taking on glucose alone! Similarly Triplett et al. 2010 also showed an 8.1% performance improvement due to a higher power output when using glucose:fructose drink during a simulated 100km cycling time trial. Interestingly Triplett did not measure gastrointestinal upset directly, but did report that participants on the glucose:fructose experienced no problems at all whilst many of his participants in the glucose only trial reported problems with their stomachs ‘not emptying the solution’. More recently Rowlands et al. (2012) studied the use of maltodextrin:fructose in a more practical application, using a 2h 30min mountain bike race and high intensity cycling lab test. The results also showed a significant improvement in performance in both the lab and field, with one of the most interesting findings of the study being a significant reduction in gastrointestinal upset as a result of using a maltodextrin:fructose solution. With Rowland’s et al. (2012) reporting a significant reduction in GI upset as a result of using multiple transportable carbohydrates both in the lab and in the field, these findings could suggest that the carbohydrate solution which participants were taking on during the study was being emptied from the stomach faster and caused less GI distress as a result of the addition of fructose. An earlier study by Jeukendrup and Moseley (2008) looked at the effect of adding fructose to glucose on gastric emptying speed during a 120min cycling bout at 61% of the participant’s VO2max. Results from the study suggested that using glucose:fructose increased the rates of gastric emptying and fluid delivery compared with glucose alone. This has quite significant practical implications as the reported faster gastric emptying would result in a faster delivery of water, aiding hydration and a reduced occurrence of stomach upset during exercise. As an athlete undertaking repeated bouts of training or competition, the speed at which your endogenous stores of carbohydrate can be replenished after exercise can have a significant impact on your subsequent race performance or training session, so the quicker and more substantially these stores can be replenished, the better the performance in the next exercise bout. One of the major limiting factors in the restoration of these carbohydrate stores is the speed of absorption of carbohydrate (Jentjens and Jeukendrup, 2003) which is significantly increased by the use of maltodextrin:fructose. Recent studies by Wallis et al. 2008 looked at the effect of combined glucose and fructose ingestion on short term recovery of muscle glycogen after exercise. The result of the study showed that both glucose and glucose:fructose elicited similar rates of resynthesis but, didn’t see any detriment to their recovery through the use of fructose and reported re synthesis rates comparable with the highest previously reported. More recently Decombaz et al. (2011) looked at the effect of malotdextrin:fructose on liver glycogen synthesis, the body’s other major store of carbohydrate, which appears to be replenished before muscle glycogen is. The results showed a massive doubling of carbohydrate storage in the liver through the addition of fructose! This is particularly significant as a reduction in the time taken to replenish the body’s stores of carbohydrate could massively aid subsequent performance or training. It is important to point out that, in order to experience the benefits of using multiple transportable carbohydrates over that of a single form of carbohydrate, you need to saturate the transporters in the intestine that absorb the carbohydrate as comprehensively as possible, so to experience the benefits, an intake of 90grams of carbohydrate per hour is recommended. Taking on board only 60 grams per hour will supply a good level of carbohydrate to the blood with an extremely low chance of any gastrointestinal discomfort, but the higher doses are where the true benefits of maltodextrin:fructose lie over single carbohydrate forms. Further to this, a recent review by Jeukendrup (2010) has shown that carbohydrate oxidisation is not related to body weight so an intake of 90grams of carbohydrate per hour can be achievable regardless of body size. This is quite a large volume of carbohydrate and in order to achieve these sorts of intakes during competition to maximise performance, it is beneficial to practice during training. There is evidence that the gut is a trainable organ, so to ensure you can cope with the high carbohydrate intake it’s important to practice your fuelling strategy during training as this will ensure come race day you can be confident that you can take sufficient amounts on board. A carbohydrate intake of up to 90grams per hour in the form of 2:1 Glucose-Derivatives:Fructose will aid your performance, reduce the occurrence of stomach upset, speed up the delivery of water and rapidly increase the rate at which carbohydrate can be replenished after exercise. However it is important to point out that you will only get optimal benefits through taking in the full 90grams of carbohydrate an hour and in order to comfortably achieve this intake, it may require some practice so that the gut gets used to these high volumes. As other non Glucose-Derivatives:Fructose products will only allow 60g of carbohydrate absorption per hour, you are losing nothing by starting at this level though (2 TORQ units per hour) and the nature of the multiple-transportable carbohydrate cocktail will be very light on the stomach due to it being significantly below your absorption threshold. You literally have everything to gain from using TORQ’s formulations. We recommend that you start at 2 TORQ units per hour and train yourself up to 3. Wallis, G.A., Rowlands, D.S., Shaw, C., Jentjens, R.L., Jeukendrup, A.E. (2005). Oxidation of combined ingestion of maltodextrins and fructose during exercise. Medicine & Science in Sports & Exercise. Mar;37(3):426-32. 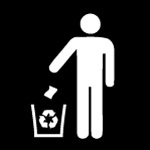 Currell, K., Jeukendrup, A.E. (2008). Superior endurance performance with ingestion of multiple transportable carbohydrates. Medicine & Science in Sports & Exercise. Feb;40(2):275-81. Triplett, D., Doyle, J.A., Rupp, J.C., Benardot, D. (2010). An isocaloric glucose-fructose beverage’s effect on simulated 100-km cycling performance compared with a glucose-only beverage. International Journal Sport Nutrition & Exercise Metabolism. Apr;20(2):122-31. Rowlands, D.S., Swift, M., Ros, M., Green, J.G. (2010). Composite versus single transportable carbohydrate solution enhances race and laboratory cycling performance. Applied Physiology Nutrition & Metabolism. Jun;37(3):425-36. Jeukendrup, A.E., Moseley, L. (2010). Multiple transportable carbohydrates enhance gastric emptying and fluid delivery. Scandinavian Journal of Medicine & Science in Sports. Feb;20(1):112-21. Wallis, G.A., Hulston, C.J., Mann, C.H., Roper, H.P., Tipton, K.D., Jeukendrup, A.E. (2008). Postexercise muscle glycogen synthesis with combined glucose and fructose ingestion. Medicine & Science in Sports & Exercise. Oct;40(10):1789-94. Décombaz, J., Jentjens, R., Ith, M., Scheurer, E., Buehler, T., Jeukendrup, A., Boesch, C. (2011). Fructose and galactose enhance postexercise human liver glycogen synthesis. Medicine & Science in Sports & Exercise. Oct;43(10):1964-71. Jeukendrup, A.E. (2010). Carbohydrate and exercise performance: the role of multiple transportable carbohydrates. Current Opinion in Clinical Nutrition & Metabolic Care. Jul;13(4):452-7. Jentjens, R & Jeukendrup, A. (2003). Determinants of post-exercise glycogen synthesis during short-term recovery. Sports Medicine. 33(2):117-44.